Researchers have pioneered a new way to synthesize DNA sequences through a creative use of enzymes that promises to be faster, cheaper, and more accurate. DNA synthesis is a fundamental tool in the rapidly growing field of synthetic biology, in which organisms can be engineered to do things like decompose plastic and manufacture biofuels and medicines. 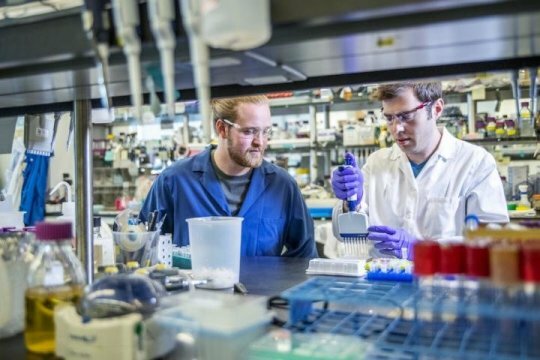 Now in what could address a critical bottleneck in biology research, researchers at the Department of Energy's Joint BioEnergy Institute (JBEI), based at Lawrence Berkeley National Laboratory (Berkeley Lab), announced they have pioneered a new way to synthesize DNA sequences through a creative use of enzymes that promises to be faster, cheaper, and more accurate. 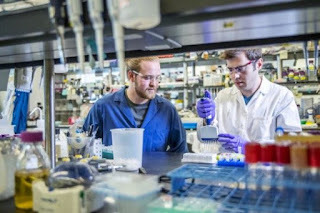 The discovery, led by JBEI graduate students Sebastian Palluk and Daniel Arlow, was published in Nature Biotechnology in a paper titled "De novo DNA Synthesis Using Polymerase-Nucleotide Conjugates." "DNA synthesis is at the core of everything we try to do when we build biology,"
said JBEI CEO Jay Keasling. Sebastian and Dan have created what I think will be the best way to synthesize DNA since [Marvin] Caruthers invented solid-phase DNA synthesis almost 40 years ago. What this means for science is that we can engineer biology much less expensively and in new ways than we would have been able to do in the past. The Caruthers process uses the tools of organic chemistry to attach DNA building blocks one at a time and has become the standard method used by DNA synthesis companies and labs around the world. However, it has drawbacks, the main ones being that it reaches its limit at about 200 bases, partly due to side reactions than can occur during the synthesis procedure, and that it produces hazardous waste. For researchers, even 1,000 bases is considered a small gene, so to make longer sequences, the shorter ones are stitched together using a process that is failure-prone and can't make certain sequences. A DNA sequence is made up of a combination of four chemical bases, represented by the letters A, C, T, and G. Researchers regularly work with genes of several thousand bases in length. To obtain them, they either need to isolate the genes from an existing organism, or they can order the genes from a company. "You literally paste the sequence into a website, then wait two weeks, Let's say you buy 10 genes. Maybe nine of them will be delivered to you on time. In addition, if you want to test a thousand genes, at $300 per gene, the costs add up very quickly." "DNA is a huge biomolecule, Nature makes biomolecules using enzymes, and those enzymes are amazingly good at handling DNA and copying DNA. Typically our organic chemistry processes are not anywhere close to the precision that natural enzymes offer." The idea of using an enzyme to make DNA is not new -- scientists have been trying for decades to find a way to do it, without success. The enzyme of choice is called TdT (terminal deoxynucleotidyl transferase), which is found in the immune system of vertebrates and is one of the few enzymes in nature that writes new DNA from scratch rather than copying DNA. What's more, it's fast, able to add 200 bases per minute. In order to harness TdT to synthesize a desired sequence, the key requirement is to make it add just one nucleotide, or DNA building block, and then stop before it keeps adding the same nucleotide repeatedly. All of the previous proposals envisioned using nucleotides modified with special blocking groups to prevent multiple additions. However, the problem is that the catalytic site of the enzyme is not large enough to accept the nucleotide with a blocking group attached. "People have basically tried to 'dig a hole' in the enzyme by mutating it to make room for this blocking group," Arlow said. "It's tricky because you need to make space for it but also not screw up the activity of the enzyme." Palluk and Arlow came up with a different approach. "Instead of trying to dig a hole in the enzyme, what we do is tether one nucleotide to each TdT enzyme via a cleavable linker, That way, after extending a DNA molecule using its tethered nucleotide, the enzyme has no other nucleotides available to add, so it stops. A key advantage of this approach is that the backbone of the DNA -- the part that actually does the chemical reaction -- is just like natural DNA, so we can try to get the full speed out of the enzyme." Keasling finds the approach clever and counterintuitive. "Rather than reusing an enzyme as a catalyst, they said, 'Hey, we can make enzymes really inexpensively. Let's just throw it away.' So the enzyme becomes a reagent rather than a catalyst," he said. "That kind of thinking then allowed them to do something very different from what's been proposed in the literature and I think accomplish something really important." They demonstrated their method by manually making a DNA sequence of 10 bases. Not surprisingly, the two students were initially met with skepticism. "Even when we had first results, people would say, 'It doesn't make sense; it doesn't seem right. That's not how you use an enzyme,'"
"After decades of optimization and fine-tuning, the conventional method now typically achieves a yield of about 99.5 percent per step. Our proof-of-concept synthesis had a yield of 98 percent per step, so it's not quite on par yet, but it's a promising starting point," Palluk said. "We think that we'll catch up soon and believe that we can push the system far beyond the current limitations of chemical synthesis." "Our dream is to make a gene overnight," Arlow said. "For companies trying to sustainably biomanufacture useful products, new pharmaceuticals, or tools for more environmentally friendly agriculture, and for JBEI and DOE, where we're trying to produce fuels and chemicals from biomass, DNA synthesis is a key step. If you speed that up, it could drastically accelerate the whole process of discovery."